Here’s a great way to balance that up. Maintaining healthy glowing skin, mind and body despite our busy schedules with a 10-min me time daily. Use a device, at home. One that is easy to use and uses the power of light energy to deliver luminous, even-toned radiance that lasts. 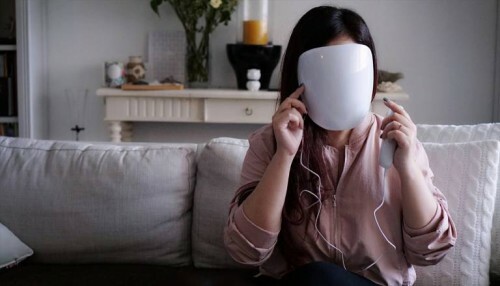 The latest Neutrogena Fine Fairness Light Mask, is a wearable LED device that delivers skin-salving red and infrared wavelengths deeper into the inner layer of skin at the speed of light to unlock its inner radiance. It boosts radiance, firmness and elasticity in skin and evens out skin tone making makeup application smoother and faster . Having tried it for the past week, I like that it’s also powerful, safe, lightweight (100gm), chemical free, easy to use and fits into my schedule. My Me Time, Upgraded! So if you haven’t time to mask, to sort out facial appointments or keep still for 1.5 hours on the facial bed, how about combining mask with the brightening benefits in 10-mins? 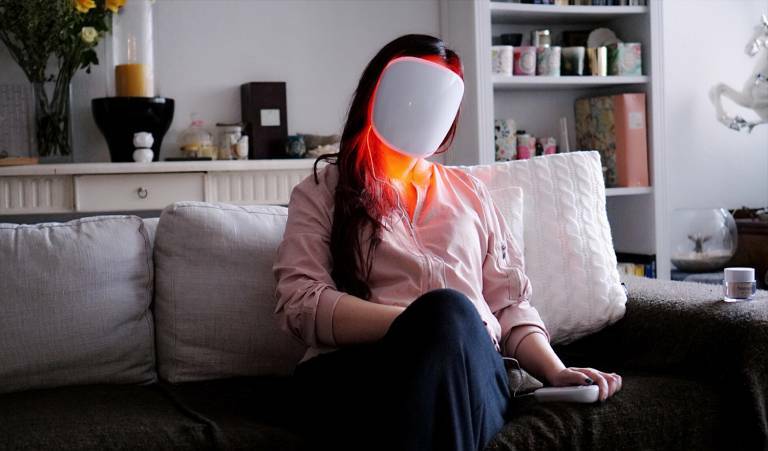 Inspired by the same LED technology used by the NASA scientists, it’s now been adapted to a Light Mask version like this to increase the healing rate of wounds and act as an inflammation mechanism. A technology that was once accessible only to doctors and dermatologists, it delivers an affordable, safe and chemical-free home care and maintenance. Firstly, the design of the Light Mask ensures that skin receives consistent light energy to unleash even-toned fairness on the whole face. 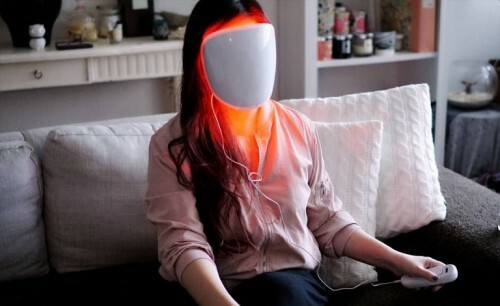 Then imagine in mere 10 mins, you have two types of light working together in the speed of light under that mask to give your skin the much-needed TLC after a long day – 12 red LED bulbs to curb skin inflammation linked to excess pigmentation and 6 infrared LED bulbs to help stimulate collagen and elastin. It wakes the metabolizing cells responsible for our skin luminosity up by going into the deeper layers of our skin. Enzymes that stimulate the production of brighter, newer skin cells while suppressing the production of melanin-induced dark spots will be at work. 96% of women saw better skin tone after using the mask and when used together with the Fine Fairness range, results are 3x faster! Speaking of Fine Fairness, the Gel Cream after mask smells wonderful ending the whole light-masking experience in an uplifting yet calming note. Formulated with Healthy White Booster, Vitamin B3, C and Hexinol, it targets the texture, tone and hydration from the inner layers of skin when paired with the Light Mask. Wear for 10 minutes and relax. After cleansing and drying your face, put the mask on like pair of sunglasses. Turn it on by pressing on the power button of the activator for 1 min and release. Rest your eyes, listen to some music, light a candle or do a foot-soak, while your skin is bathed in red and infrared light for 10 minutes. To enhance the experience further, apply the Fine Fairness Gel Cream like a moisturizer. Bringing expert solutions home, safe and utilises not one but two lights that work simultaneously on the whole face. Now, that’s taking skin radiance to a new dimension with a 100% light-based solution in the comfort and privacy of your home! The Neutrogena Fine Fairness Light Mask will be available exclusively online at S$119.90 (includes one Mask and a 30 session Activator). Why 30? Because it works on a skin renewal cycle of one month, just like skin. After 30 sessions, you just need to repurchase the Activator (S$49.90) to continue light-masking. Available only online at Lazada.sg and Qoo10.sg from August 2017 onwards. You too can bring home the light with Clozette’s Neutrogena Giveaway!